As a way to both look back at a great minor league season and celebrate the release of the 2019 Twins Prospect Handbook, I’m going to be putting together a series of features that should help bring some of the prospects to life. First up is a new name to the system, Jhoan Duran. In last year’s Prospect Spotlight Series, I took a deeper statistical look into a handful of guys I was higher on than most. Here are links to those articles if you’re interested in looking back: Travis Blankenhorn, Ben Rortvedt, Lachlan Wells, Tom Hackimer and Zander Wiel. Instead of focusing on “my guys” this year, I’m going to pass along some of the really fun stuff I saw in 2018 from Twins prospects. So this will be sort of a show-and-tell version of the Prospect Spotlight Series. 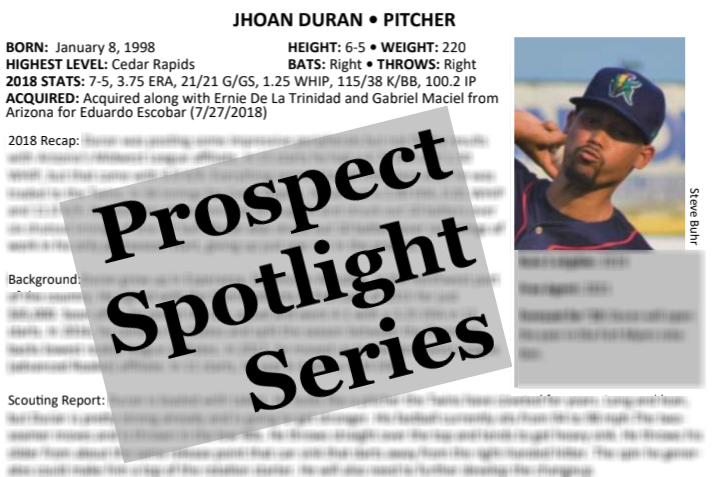 First up on the list is Jhoan Duran. We’re going to look back at his impressive performance for the Cedar Rapids Kernels on Aug. 24. I apologize for the lo-fi, bootleg video quality, it was the best I could do. Wow. I don’t envy those hitters. Duran pitched 6 2/3 innings of one-hit ball and racked up 10 strikeouts in that start. Of his 97 pitches, 62 went for strikes (63.9%) and he induced an impressive 19 swinging strikes (19.6%). That was certainly a performance that gets you dreaming of Duran someday dealing on the Target Field mound. When the Twins acquired Duran, he had a 4.73 ERA and 1.50 WHIP in 15 starts. I'll admit, that didn't exactly capture my imagination. Throw in the fact that he was acquired in the deal that sent away Eduardo Escobar, a guy who had been among my favorite Twins for years, and I was struggling to get very excited at the time. I'm not sure if the Twins tweaked anything or if the trade was just a wake-up call, but Duran looked like a new man after joining the Twins. In his six regular season starts with Cedar Rapids, Duran posted a 2.00 ERA, 0.81 WHIP and 4.40 K:BB ratio. He added six innings of one run ball and 10 more strikeouts in his lone postseason start for the Kernels. We had a ton of fun putting the Prospect Handbook together and we’re really excited for people to read it. Recognizing these minor league players for their efforts and ability is a big motivating factor in the project, so we would love for you to pick up a copy. Duran is just one of more than 160 players featured in the book. He’s quickly becoming a notable name, but as fun as prospect lists are, guys emerge from relative obscurity to reach the major leagues on a regular basis. Andrew Vasquez was a 32nd-round pick who never garnered prospect list love, but he earned his way all the way to the Major Leagues last season, becoming the first member of the Twins’ 2015 Draft class to arrive in Minnesota. Who’s going to be the next homegrown Twins talent to emerge? That’s a great question. The only thing I can say for certain is he’s somewhere in the pages of this year's handbook. Click here for more information on the 2019 Minnesota Twins Prospect Handbook. To follow up on this, I looked up Gonsalves’ minor league numbers: 108 games started, 599IP, 2.42ERA, 1.10WHIP, 9.5/3.6 K/BB. Duran’s numbers: 54GS, 259IP, 4.02ERA, 1.32WHIP, 8.0/3.2K/BB. Gonsalves had 4 mediocre starts in the big leagues and people have written him off. Not to throw shade on Duran, like I said I hope he turns into a great prospect for the Twins and sustains the improvement. I would have Gonsalves ahead of Duran on prospect lists, though. He could turn into a mainstay in the rotation for years to come. Duran is a long way from becoming that. When a pitcher leaves the Twins and suddenly a light bulb goes off and his performance is better, many here and elsewhere begin stoning the Twins coaching staff.Wouldn't that mean that we should be heaping glory on the pitching coach at Cedar Rapids?Wasn't he the reason that Duran made the adjustments needed to take that huge step forward? While I have always liked Gonsalves and his stats, when it comes to prospect lists it typically is about potential.Duran has a 60 to 65 fastball along with an average curve and Change I believe.Gonsalves can never match the speed and likely the movement on Duran's fastball therefor his ceiling will always be lower.In prospect lists no one is saying one player is better than another only that their potential skills have a chance to be higher. In this case given the information we have IMO I think Duran should be in front of Gonsalves.Taking nothing away from Gonsalves but he is limited by how hard he can throw the ball.He has to be more deceptive with his pitches to have the same level of success that Duran would have as he can blow the ball by batters. He's an interesting prospect to be sure. How big is he? This piece lists him at 220lbs; BRef has him at 175lbs (as does Puckett's Pond, but they might be drafting off BRef). Did he really add that kind of weight and fill out that much? I think that secondary tier is the right area for him, because while he's got a lot of things that are encouraging, there's still plenty for him to work on as a starter. (getting deeper into games, cutting down the BBs, etc) He's been awfully hittable in other stops, so we probably need to be a little careful about putting too much emphasis on 6 starts in Cedar Rapids. I mean, in his 15 starts before he became a Twin he barely averaged 4 innings an outing and was eminently hittable. Thanks for bringing this up. Another huge selling point to this year's Prospect Handbook is that it includes an accurate height and weight on each player. What's listed on those MiLB or B-Ref profiles is comically outdated, sometimes multiple years old. I wouldn't be surprised if that 175 listing is from when he originally signed back in 2015. For example, Brusdar Graterol is still listed as 6-1, 180 on those sites. No way, the guy looks like a linebacker now. Tom, the video post was outstanding stuff! Seems to me Duran is clearly well north of the 170 or so pounds he's listed at in various places. Also looks like he has room to still fill out. I really like his delivery, it seems smooth and repeatable to me. Also encouraged, as you stated, that he had so much velocity late in the season. When you watch these clips, and read his stat lines once he came over, but compare his previous numbers, you have to wonder who the real Duran is. I get that he's young, but WOW, what a difference. Makes you wonder why they included him in the trade. Makes very excited to see what he does next year. Note: I understand rankings based on ceiling and projections. And really, not sure if I care that Gonsalves or Duran are ranked above or below one another. And I would agree that Sudan's ceiling is higher than Gonsalves. But I also agree a few poor-mediocre-solid appearances at the end of 2018 shouldn't define Gonsalves at this point. Yes, never trust the measurables on MLB official sites or B-Ref for minor league players. They use the numbers they had when they were drafted or signed (or even well before that) and I don't think I've ever seen them be updated until they make their MLB debut and teams officially update the media guides and what not for them. I had Gonsalves at #1 a couple of years ago. It is interesting, and probably unfair, that as players move up and we have more data points and learn more about their stuff and such, they tend to move down as they move up. For me, Duran has the fastball, the movement, the secondary pitches have a chance. He could be a top-half-of-the-rotation starter. I still think that Gonsalves can be a 3-4 starter, and his odds of being that are certainly much higher than the odds of Duran becoming a #2. Simply, he's closer and he's put up numbers at three levels that Duran hasnt even pitched at. Therein lies the difficulty (or the fun) in prospect rankings. You'retrying to project ceiling while still factoring in likelihood to reach those levels. Definitely not an exactly science, thats' for sure. And yes, we were happy to get the updated weights of players for the handbook. It certainly helps better tell the story, especially from a scouting standpoint. The Graterol one was definitely the biggest difference between whats online and what reality is. The nice thing is that we have one of the guys that helped get Kluber running our FO... hopefully guys like Duran or Acala turn into a nice piece like Kluber did for Cleveland. While I definitely agree we shouldn't give up on Gonsalves, Duran's stuff is WAY better than Gonsalves' stuff. Gonsalves has never hit 96, let alone 93 or 94, and he has never had a breaking ball anywhere close to Duran's. Mid-90s with tail, flashes plus change and breaking ball. Consistency issues. Has arguably the best pure stuff of any pitching prospect on this list. That's pretty high praise, and "consistency issues" are quite common among even very good young pitchers in the lower minors. 1. How does one pronounce “Jhoan”? 2. Is his nickname Jhoan “Hungry Likes the Wolves” Duran or just Jhoan “Duran” Duran? 3. Can he be convinced to start calling himself Johan? Wow. I don’t envy those hitters. Wow, great video commentary, Tom! Sorry, but I've gotta steal "looks like that kid just saw a ghost" next season, that's an instant classic. His name is said in the video a couple times, probably the clearest right at about the 7:00 mark, but if I was to try and type it out phonetically I guess it'd be something like Jo-ahn Dur-ahn. How about Jhoan "Hungry Wolf" Duran? That's a pretty badass nickname. I like Duran but really he's a long way away. This year will be good for us all getting a handle on him. The change from coming to our org could be many things but it's a good sign that he was able to control the walks. He looks like a guy who could be rushed a bit. I would assume he starts in Cedar Rapids but it would be nice if they moved him straight to A+. That's good to know and makes me feel even better about him as a prospect. Hopefully the additional weight and strength will increase his stamina along with the velocity and allow him to get deeper into games. 220lbs seems about right for his frame, and it'll probably help him to not need to keep adding weight and just get used to being this size. It could be that was one of the triggers that helped him have such increased success with the twins. I wouldn’t get your hopes up about Duran’s improvements, but one thing I would be excited about if he starts moving prospect lists, is the possibility that he, along with other expendable prospects, could be moved for a “frontline(ish) starter” next offseason, or maybe as soon as next year’s trade deadline. Boy, if Duran turns into something good in the majors, then the Escobar trade was 100% worth it, possibly 200%. Duran could make many look silly for saying it was a bad trade for the Twins, and I'm hoping to see him prove his worth in the majors someday. From everything I gather, he seems to be a very level headed & humble kid.Just seeing his demeanor change from being locked in on that mound throughout the game, then seeing him afterwards mingling w/fans as a very humble and appreciative kid impressed me.Very much like R. Lewis impressed me. Jhoan deserves some accolades after he joined the Kernels.Still room for skepticism, but he's off to a GREAT start with the organization. As for the Gonsalves vs. Duran piece.Come on.The closer a guy gets to the majors, the further he sinks on prospect lists.It's just baseball nature, for obvious reasons.Only the freaks stay at the top and prove it (i.e. Acuna, Albies, Guerrero Jr., Bregman, etc. ).I guess Guerrero hasn't proven it yet, but he's as sure thing as they get. Yep when they are drafted they are full of potential and haven't proven much.Once they have proven themselves there is very little potential left so we know pretty much what they can and cannot do.That is why prospects can slip after making it further up.They don't quite live up to the potential we saw earlier in their career, but yes some do actually live up to their potential and never slip back down.Those are typically the most exciting players. I really like the Twins system right now and hope they can turn some of these good players into great players as we could use some higher rated\top 100 players. "Andrew Vasquez was a 32nd-round pick who never garnered prospect list love, but he earned his way all the way to the Major Leagues last season. " True, where MoY allowed him to throw 3-4 pitches per outing once in a while. I'm excited to see some of these young bucks in the next cpl years, and hopefully, we've got a Mgr now that will let them actually play a little.